Doc Halligan is on a mission to save 80,000 dogs and cats from being euthanized every week. How? By spaying and neutering as many dogs and cat as possible with the Lucy Pet Foundation. 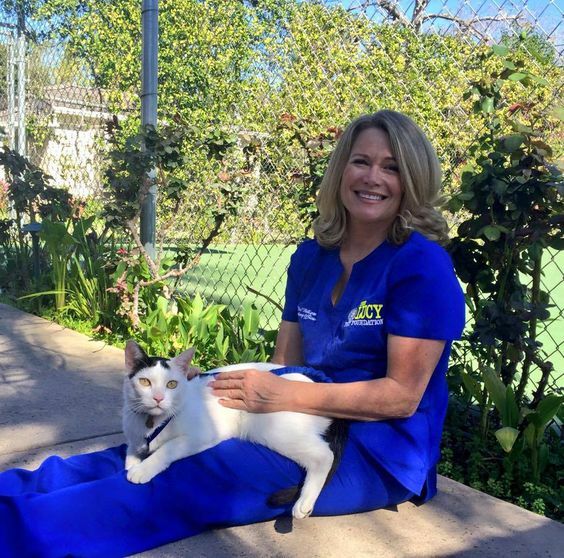 Dr. Karen “Doc” Halligan is Chief Veterinary Officer of the Lucy Pet Foundation, which has spayed, neutered, or vaccinated more than 12,000 cats and dogs in just three years. That’s veterinary care for 4,000 animals each year, or more than 10 every day. Doc and the Lucy Pet Foundation received a $500,000 annual contract with the City of Los Angeles to provide free spay, neuter, and vaccination services. That will help Los Angeles become a “no kill” city. Lucy Pet is making waves—literally—because on January 2, 2017, you’ll see Doc Halligan and the Lucy Pet team atop their Rose Parade float with surfing dogs. Yes, you heard that right: dogs will surf on top of the Lucy Pet Rose Parade float. 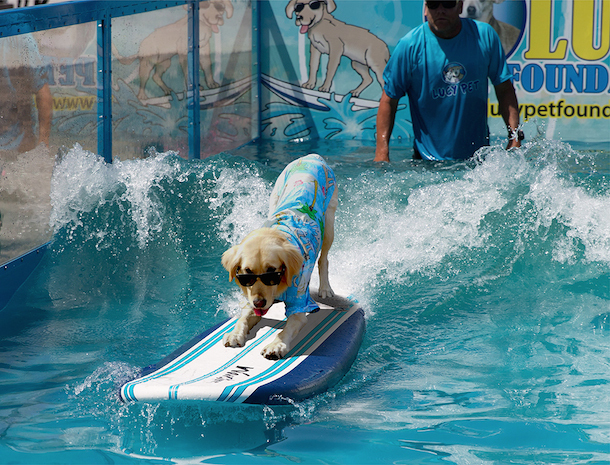 The dogs will take 75 foot-long surf rides made by the world’s first wave-making machine atop a parade float. 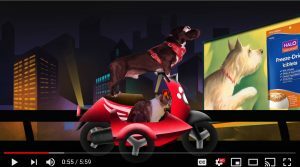 I will also be up on Lucy Pet’s Rose Parade float, streaming the action Live on Positively Woof’s Facebook page. 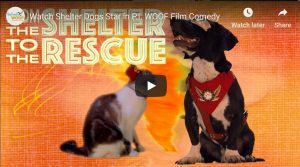 I hope you can join us, because this show’s success will help Lucy Pet build more awareness for shelter animals and spay and neuter causes, and bring their mobile spay and neuter buses across the country! 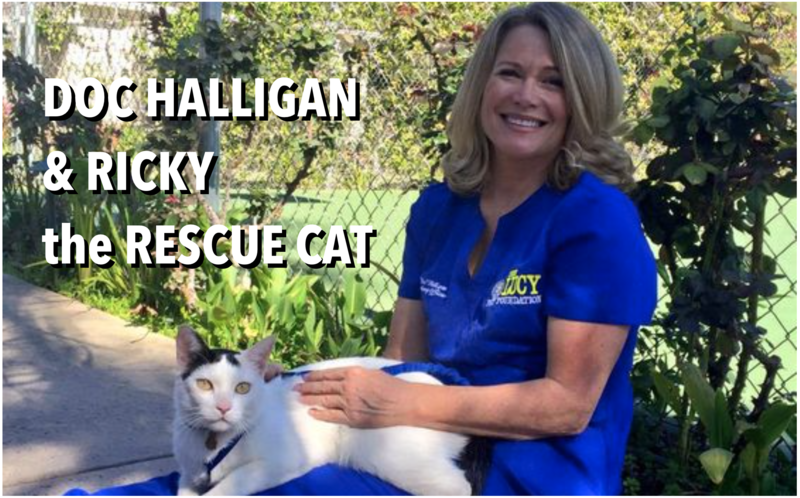 Doc Halligan will be joined on Lucy Pet’s Rose Parade float by Ricky the Rescue Cat. Ricky is the cat featured in Lucy pet’s logo. Ricky can surf, but he doesn’t like to surf with dogs around. So instead, Ricky will be with Doc, waving to the crowd. Ricky is Lucy Pet’s Cat Feline Ambassador of Good Will and humane education, visiting schools and after-school youth programs. 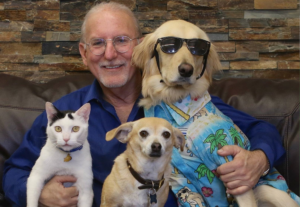 Ricky and Doc Halligan remind us that 70% of all cats in shelters and 1.2 million dogs are euthanized because of over-population, which means that spaying and neutering our pets is the most important thing we can do to help end over-population. Dog Rescue Stories: It Was Love At First Sight for Tally and His Forever Mom!